Forensic Examination of Signatures explains the neuroscience and kinematics of signature production, giving specific details of research carried out on the topic. It provides practical details for forensic examiners to consider when examining signatures, especially now that we are in an era of increasing digital signatures. Written by a foremost forensic document examiner, this reference provides FDEs, the legal community, the judiciary, and the academic community with a comprehensive record of the state-of-the-art of signature examination and plans for addressing future research into improving the reliability of FDEs. 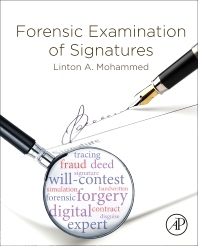 Dr. Linton Mohammed has been in the field of Forensic Document Examination for more than 30 years. His PhD thesis was entitled “Elucidating spatial and dynamic features to discriminate between signature disguise and signature forgery behavior.” He has testified as an expert witness more than 100 times in the US, England, and the Caribbean. He is the co-author of “The Neuroscience of Handwriting: Applications for Forensic Document Examination” and has published several papers in peer-reviewed journals. Dr. Mohammed has conducted or co-presented workshops on signature and document examination in Australia, Brazil, Canada, China, Latvia, Poland, Saudi Arabia, Turkey, and the United States. In 2012, he was given the New Horizon Award in Recognition of Exceptional Contributions in Scientific Research for the Advancement of Forensic Document Examination by the American Board of Forensic Document Examiners, Inc. Dr. Mohammed is certified by the American Board of Forensic Document Examiners, Inc and holds a Diploma in Document Examination from the Chartered Society of Forensic Sciences. He is a member and Past-President of the American Society of Questioned Document Examiners, Inc and is currently serving as the Chair of the Questioned Documents Section of the American Academy of Forensic Sciences. He serves on the Editorial Review Boards of the Journal of Forensic Sciences and Journal of the American Society of Questioned Documents and is a guest reviewer for several other journals. He also served for two years as an appointed member of the Physics/Pattern Evidence Scientific Area Committee of the Organization of Scientific Area Committees (OSAC) sponsored by NIST. Dr. Mohammed is in private practice in Burlingame, CA (San Francisco Bay Area).